Get a free bumper sticker! Just send us an email with your mailing address to: strongernorthcarolina@gmail.com. Donations towards postage are appreciated. Thank you to everyone who has contributed and/or is sporting a sticker to share the word! 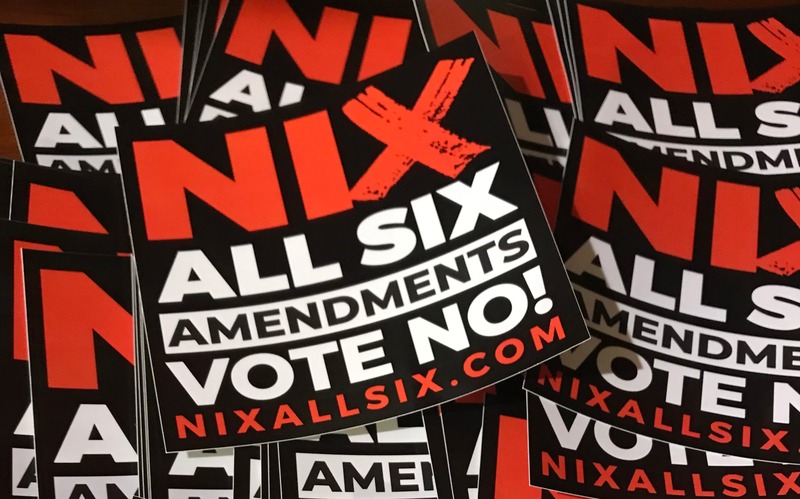 We have distributed nearly 2,000 stickers across the state, and have had well over 20,000 hits to our NixAllSix.com site in just a short period. Stronger NC's mission has always been to make civic engagement easier through voter education. With six North Carolina Constitutional Amendments on the ballot in November 2018, we are redoubling our efforts to reach our fellow citizens and need your help. Knowing their supermajority is likely to end after November, legislators proposed these amendments strictly along party lines and in secret to strip more power from the executive branch, pack the judiciary with their own appointments and allow a few powerful leaders to select who is eligible to vote in 2020 - none of which benefit the people of North Carolina. We found out how hard it can be to change a law with HB2, but changes to the Constitution will be even harder to correct once made. Democracy means we're in this together, so we're asking for your help with our #NixAllSix campaign. We've developed a website, shareable resources and other materials to educate voters about these ill-defined amendments. Visit nixallsix.com to learn more. Please join us in our efforts to #NixAllSix, and save democracy in North Carolina. StrongerNC, Inc., is a 501c4 grassroots organization comprised of North Carolinians who care about the future of our state and the fundamental rules of democracy. We are not affiliated with any party or candidate. Thank you for putting this together. A little slick marketing to save our Constitution (and citizens) is just what we need!